James is running back and forth taking bit by bit to begin the move into the new NHA Compound. There is so much left to be done to put it into proper "live in" condition. With the latest news that Kadijah is pregnant, the need to finish the Compound is more urgent. Congratulations to the Mansaray Family, new life, new joy. 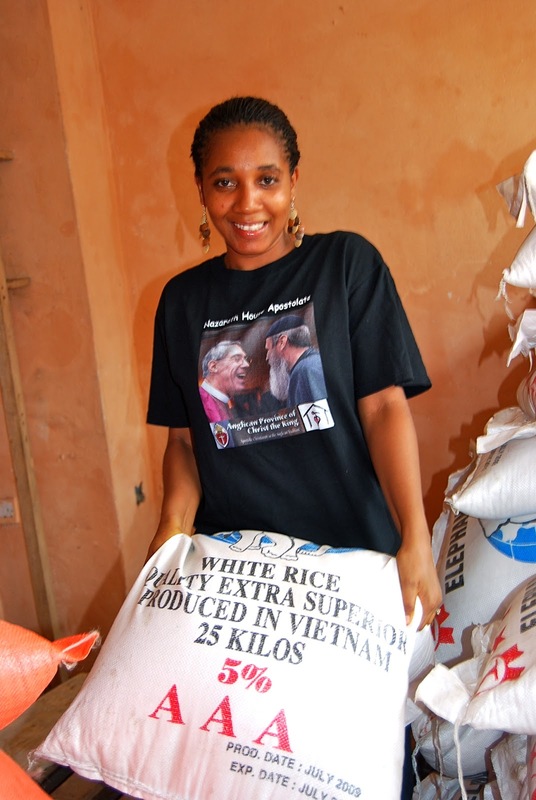 Kadijah works very hard to give aid to those around her, fixing many meals for those in need, distributing medication, generally taking care of the sick. I think Kadijah loves to wear this shirt. We see her in it all the time. With the added stress of pregnancy (she is suffering severe morning sickness), we just can't allow her to walk the great distance to the stream to bathe, wash clothes and carry water back to the Compound for cooking, etc. people are hungry, people are sick. It is imperative that we build up our team, adding new members to the NHA family. With an enlarged support base we can get closer to the goal of 1000 people giving monthly. Please help us pay the debt ($12,302 in total) on the NHA Compound and move forward, working to change more lives, providing new opportunities for a healthier life. This past week, James was in Kabala unloading furniture when a Government Hospital nurse approached about giving Worm Medicines to the NHA students at our school. and to think that they considered our students AND brought the medicines to our School. This is amazing and we are so thankful! We are not alone in our work, its a team effort. Lucy was in Kabala with James and was able to help the nurse distribute the tablets and measure and weigh the children. Education is such an important measure in providing a better life for these children. Please consider helping Nazareth House Apostolate make a difference in their lives which ultimately changes the lives of those who give as well. What a week for NHA.